This page is devoted to the electrical and mechanical aspects of the AGC and DSKY, and perhaps eventually to electrical and mechanical aspects of the entire G&N (guidance and navigation) system. The complete set of engineering drawings (electrical schematics and mechanical drawings) for AGC/DSKY and other G&N components, in all revisions, in the form of scanned images of the original Apollo Program drawings. Contemporary Apollo Program theory-of-operation documents for the above. Electrically and visually accurate transcriptions of those electrical schematics into a modern open-source electrical CAD program. Accurate translation of mechanical drawings of fabricated parts into reusable 3D models. Translation of AGC electrical design into Verilog hardware-description language or other standardized languages when appropriate. Simulation of the AGC hardware, via modern open-source Verilog-simulation software, or other software when appropriate. Great strides have been made toward the goal, but it nevertheless remains very distant. On the other hand, if you want to browse through the drawings by number, rather than searching, keep reading! In the table below, "Miscellaneous drawings" refers to alternate scans of some of the drawings in some of the "boxes" in the table, as well as various drawings (or revisions) that aren't in the boxes at all. Therefore, to find any given drawing, by number/revision, look in the box that covers that drawing-number range first, and then consult the miscellaneous drawings if what you want is missing from the box or is illegible. If you know what guidance-system component (AGC, DSKY, etc.) you want the drawings for, this is the right place! Various models of the Guidance&Navigation (G&N) system components such as the AGC and DSKY were designed and built during the evolution of the Apollo program. Those components were then installed into G&N systems (or used for other purposes), and the G&N systems themselves were in turn installed into spacecraft or used for other purposes. The following table allows you to access the engineering-drawing trees for some of those G&N system components. Beware, though, because there are gaps in the coverage! In no case is the drawing tree for any given component model 100% complete. On there other hand, there is so much overlap between these different models, there's little doubt that with some judicious engineering you could nevertheless construct most of these models rather faithfully from the drawings we do have. With some exceptions, AGC/DSKY models or other components never installed into G&N systems aren't referenced in the table; nor are individual components or minor assemblies. Moreover, there are additional G&N system components that I haven't been moved to add to the table below. But those additional items, where available, can still be accessed from the numerical drawing indices in the preceding section once you know the drawing numbers for them. The drawing isn't presently available. The latest available revision of the drawing doesn't include the configuration implied by the dash number. Addition of CDU support to this table is a work in progress, and is presently very incomplete. Scans of Block II AGC electrical drawings preserved by Eldon Hall, and then donated to the now-essentially-defunct klabs.org. Contains most of the digital (as opposed to analog) drawings for AGC p/n 2003993. The "AGC Handbook", contributed by Don Eyles. Mostly contains drawings for Block II AGC/DSKY part numbers other than AGC p/n 2003993. Contains many other drawings than just the electrical schematics, including top-level indices, mechanical drawings, wiring diagrams, assembly drawings, and even software lists. All of this material is hosted locally here at the Virtual AGC Project website, or else at out Internet Archive Virtual AGC site. The best portal into this mass of available original Apollo Program engineering drawings is through our MIT/IL Apollo engineering-drawing index page. For Block II and LM: AC Electronics manual ND-1021042 volume 2. Or, the full resolution scan (volume 2). 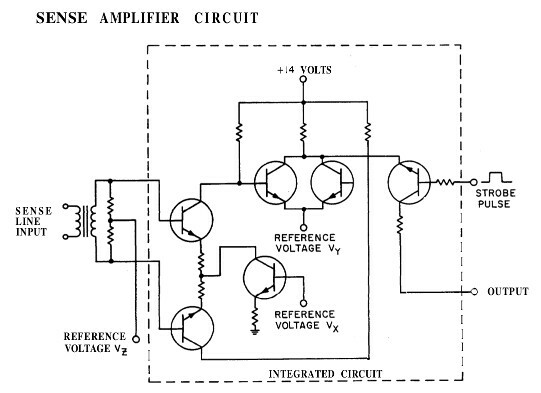 For Block I: AC Electronics manual ND-1021041 volume 1 and volume 2. Or, the full-resolution scans (volume 1 and volume 2). These documents are theory-of-operation documents, which describe the circuits textually and often provide useful information like timing diagrams of what the circuits do. In the process of providing this info, though, they provide the schematics themselves as figured embedded within the text. In saying that the schematics provided in the theory-of-operation documents are "essentially complete", what I mean is that the schematics in these volumes aren't precisely in the form of the original drawings, but rather have been redrafted by AC Electronics to fit into the format of their volumes. Thus, they are subject to mistakes (and potentially, corrections) by AC Electronics, and cannot necessarily be straightforwardly matched to specific drawing numbers or revisions. Surprisingly, while we have schematics in one form or another for all AGC/DSKY modules, though not necessarily in all of the different forms or versions we like, and we have wiring diagrams for the DSKY backplane into which its modules are inserted, we do not have wiring diagrams for the AGC backplane. (See this section for a discussion of how the AGC circuitry is partitioned up.) Nevertheless, we do have enough information about it to be useful, compiled by two techniques: Firstly, the electrical schematics for the individual circuit modules list "net names" for all of the connector pins going from the module to the backplane, so we do know how the modules were interconnected on the backplane; secondly, physical AGCs can have their backplanes mapped by means of continuity checking with an ohmmeter. Mike Stewart has put together a helpful sqlite database and an interactive, online form of it, based on mapping out the backplane for AGC s/n 14. Other useful resources may be available in the "AGC electrical schematics" section of our document-library page. Section 3.7 of the AC Electronics Final Report on Contract NAS9-497 and tables 7-IV and 7-VI of the Instrumentation Labs Final Report on Contracts NAS9-153 and NAS9-4065 can be used to relate many AGC and DSKY serial numbers to the specific missions (or in some cases, other purposes) for which they were used. In some cases, there is a discrepancy between these two documents (e.g., which DSKYs were assigned to LM-10), in which case the latter document was chosen to be authoritative. For Block I, Table 8-III in AC Electronics manual ND-1021041 can be used to obtain drawing numbers for what we believe are AGC 1003700 and DSKYs 1003706 and 1003707. For Block II and LM, tables 8-II and 3-IE in AC Electronics manual 1021042 can be used to obtain drawing numbers of electrical schematics corresponding to several AGC and DSKY assembly part numbers. For example, the AGC with p/n 2003200-011A contained, among other things, an "oscillator module" which fit into a backplane socket labeled B7, and which itself had a p/n 2005003E ... and naturally, we have drawing 2005003E if you want to see it. In general, those DASHNUMBERs cover different configurations handled within the same engineering drawing. For example, drawing 2003100 might cover both configurations -011 and -021, and you'd have to read the drawing itself to understand how unit 2003100-021 differs from unit 2003100-011. With rare exceptions, different REVISIONs of a drawing do not introduce any design changes within a specific configuration, but may be used to cumulatively add a new configuration. In other words, as long as a particular revision of a drawing contains the configuration you're interested in, it doesn't really matter (usually) that later revisions of a drawing may also exist, because later revisions won't differ substantively as far as any given configuration is concerned. In addition to providing scans of original electrical and mechanical drawings from the Apollo program, there is an ongoing effort to transcribe these drawings into CAD files. Such CAD transcriptions are made as faithfully visually to the original as is feasible, given the capabilities of the CAD program involved, as long as there is no compromise of electrical or mechanical correctness. But realize that transcription is a human effort, so transcribed CAD files may at first contain errors; conversely, they may from time to time correct errors present in the original drawings — naturally, though, with suitable notes indicating that the change had been made, and why. It has also been possible occasionally to reconstruct some currently-missing drawings from the original Apollo Program. As far as electrical CAD files are concerned, no community effort has developed to transcribe the electrical drawings into CAD, but it now appears as though one isn't really needed since I'm sure I can do them all myself ... eventually. You can simply treat the CAD files as resources which appeared from nowhere, but which you are free to use or modify for your own purposes. To do so, the open-source KiCad electrical-design software is used. It is available, for free of course, on Windows, Mac OS X, and all of the major flavors of Linux. The electrical schematics which have been transcribed into CAD, or are in the process of being transcribed, are stored in the "schematics" branch of our GitHub repository. Also they are typically rendered as PNG images as well, and provided separately for convenient browsing. It's best to use the nightly build of KiCad (presently v6) rather than a stable version of it (presently v4 or v5), to stay as up-to-date as possible with respect to the bug reports we file. A folder called Schematics/DRAWINGNUMBER/ containing the files for the drawing. For example, the CAD files for drawing 2005912B are in Schematics/2005912B/. A KiCad project file called module.pro, which you will need to open. Once the project is open, you can run the schematic editor (eeschema) from KiCad's menu. 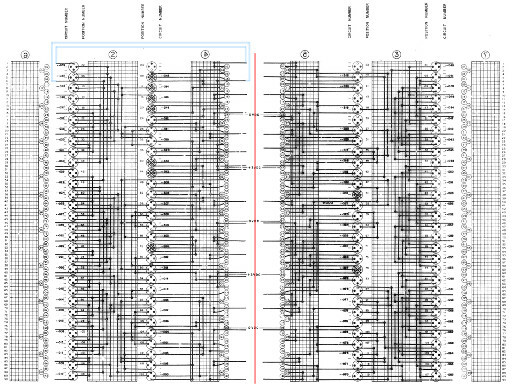 The schematic page that opens up will usually look like 2 (or 1 or 3) rectangular blocks. Each of the rectangular blocks represents one of the original sheets of the drawing. Just double-click on one of the blocks to see the schematic for that page. 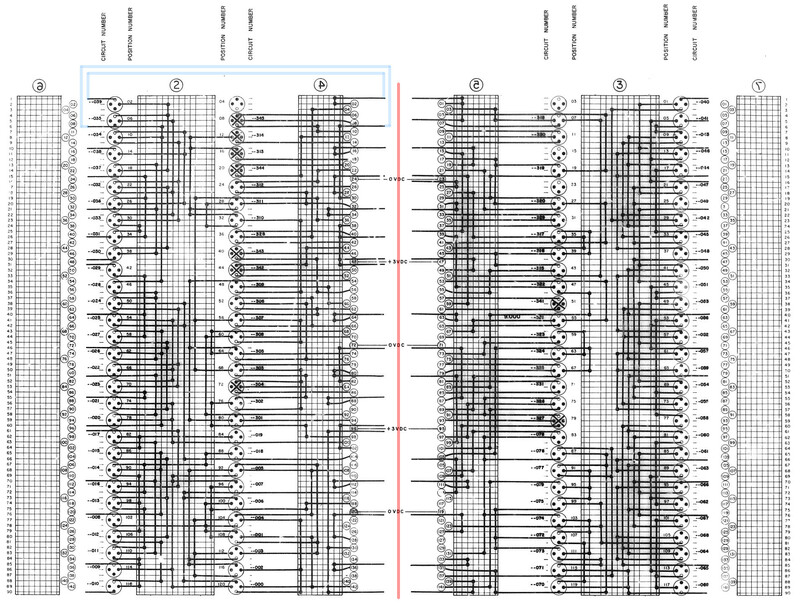 We use a grid size of 25 mils within the schematics. You should set the grid size to 25 mils and stay with it. Similarly, in the preferences, set the default line width to 20 mils. Many of the drawings consist largely of open-collector 3-input NOR gates and oval-shaped pads, neither marked on the schematics with reference designators, so you may need to rely on notes within the schematic to know what's what. All of the symbol libraries for eeschema used in our CAD drawings are custom libraries, and no standard KiCad libraries are used. If you find that symbols are missing in the schematics you load, you'll have to maneuver through KiCad's menu system to individually enable all of the libraries needed. These are the *.lib files in the GitHub repository. There are a lot of them, primarily because of visual and power-supply variations the schematics need for the dual NOR-gate part; the main library, exclusive of the NOR gates, is AGC_DSKY.lib. You may also get warnings when loading a schematic about the library versions having changed and asking if you want to "recover" any symbols. The answer is that you do not want to recover any of them, which at the present time means you will need to uncheck the boxes next to every symbol it offers to recover for you. There's a lot of more-detailed information that may be useful in the repository's README file. No mechanical drawings have yet been transcribed to CAD files (insofar as they fall officially under the aegis of the Virtual AGC project), so anything I have to say about it is somewhat theoretical. However, based on discussions with various parties interested in the topic and/or currently working on the problem for their own benefit, here is the guidance I can offer you so far. The 2D CAD files should be mechanically accurate. If changes to the original design have been made to correct errors in the original drawing (or for any other reason), you should add notes to the CAD drawing explaining what has happened, and why, when, and who made the change. The files should be in DXF format. The file naming should conform to the original Apollo drawing number and revision. In other words, if you have transcribed drawing 1234567A, it should be named 1234567A.dxf. The files should be importable by FreeCAD open-source design software, and should be visually accurate with respect to the original drawings, insofar as that is feasible, after being so imported. Models that modify the original mechanical design to handle changed requirements, such as making parts thicker so that they can be 3D printed in plastic rather than cast in metal. If changes to the design have been made to correct errors in the original drawing (or for any other reason), you should add notes to the model explaining what has happened, and why, when, and who made the change. The files should be in STEP format. 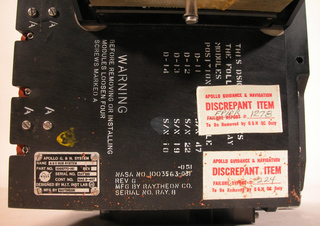 The files should conform to the original Apollo drawing number and revision. In other words, if you have transcribed drawing 1234567A, and if it is a faithful transcription, it should be named 1234567A.stp. If it is a modified transcription, then the name would be something like 1234567A-ExtraDescriptionOfChanges.stp. (I'd also personally prefer that filenames don't contain spaces, though hyphens and underlines are okay.) Files with extensive changes or other documentation needs can be accompanied by a README.md file, in "markdown" format, in which case the files would together occupy their own dedicated folder in the repository. The files should be importable by FreeCAD open-source design software. Surprisingly, digital simulation of the electronics turns out not to be incredibly difficult. Nevertheless, discussion of the topic can be rather involved, so to keep this page relatively short (really! ), a separate page is devoted to discussing digital simulation. The Block II or LM AGC contains two trays of electronics, the A-tray and the B-tray. The trays contain connectors allowing A to be connected to B, or vice-versa, and to the outside world. Each tray also contains a "backplane" into which electronics modules can be plugged. The A-tray modules have designations like A1, A2, ..., A31, while the B-tray modules have designations like B1, B2, ..., B17. Each of these modules has an associated drawing. 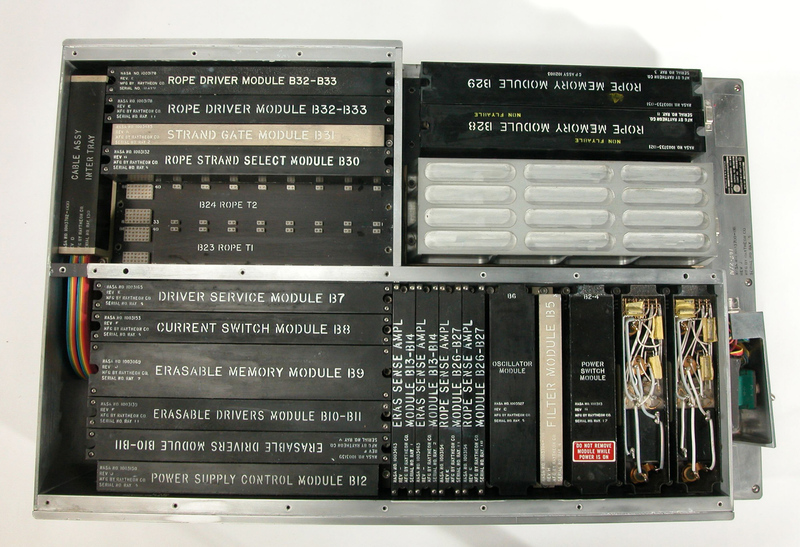 For example, in the 2003200-011 AGC, module A1 (the "scaler" module) has electrical drawing 2005259A. In other words, each module is considered to comprise a single circuit, with a unique (though possibly multi-sheet) drawing. 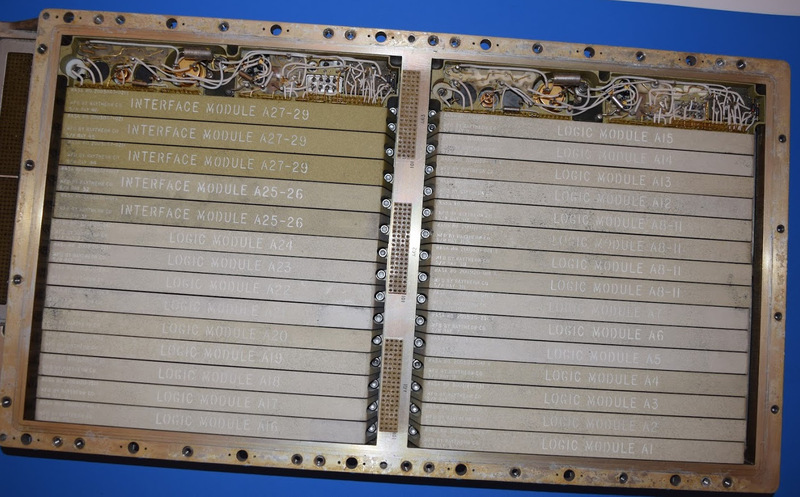 Modules A1 - A24 consist entirely of "logic": i.e., their electrical drawings consist entirely of NOR-gates and the connectors for plugging the modules into the backplane. For this reason, I suppose, the drawings aren't called "schematics", but are often given the special name "LOGIC FLOW DIAGRAMS". But they're schematics anyway. Modules A25 - A31 and B1 - B17 are entirely analog in nature and are specifically called "SCHEMATICS". 2003993, 2003200, and later 2003100 AGCs: Each module contains two multilayer circuit boards, though I've chosen to show you only one of them in the image below. We'd see the other one if we flipped the module over. 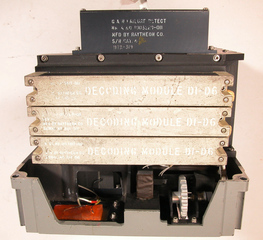 Analog modules (A25 - A29, B1 - B17): These used so-called "welded cordwood" construction. 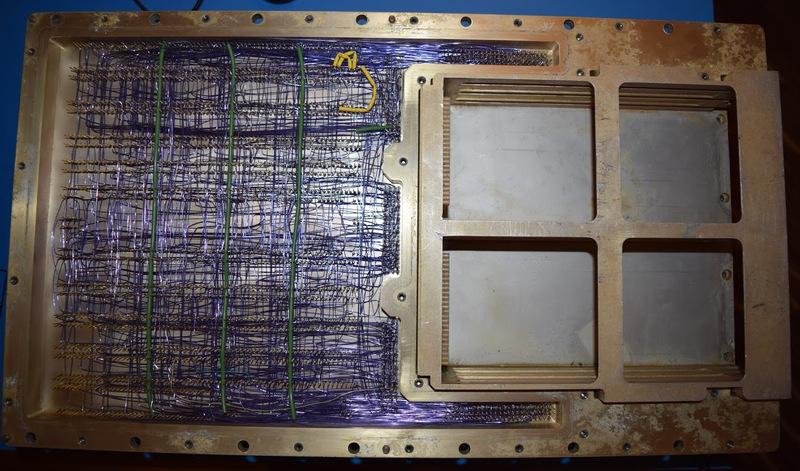 What that means is that you have a metal block with holes in it, like Swiss cheese; the components (such as resistors, capacitors, transistors, etc.) are inserted into the holes in the block, with their leads protruding from either side. Wires are then welded (not soldered) to the leads to interconnect the components. In the image below, note the nifty insert providing reference designators for the components. Of course, these details don't matter much in modern terms unless you're very enthusiastic about building an AGC re-creation and want to do it absolutely 100% authentically. If you were, you would be defeated in the end by the fact that the electronic components originally used, such as the dual triple-input NOR gates, are no longer available in precisely the form they were originally used. And while I haven't priced ferrite memory lately, I expect that it's probably not terribly cost-effective. Though, surprisingly, you can get junked ferrite-memory systems from eBay; not from the AGC, naturally, but perhaps close enough that they could be made to work if mined for parts. The pictures in this section, taken by Mike Stewart, are of Jimmie Loocke's model 2003100-071 AGC, s/n 14. Figure 4-89, Control Pulse CTR. Internal views of a 1003563-051 AGC. (Click to enlarge. Figure 4-233, Relay Matrix Display Connections (page 2). Figure 4-236, Power Supply, AGC Main Panel DSKY. 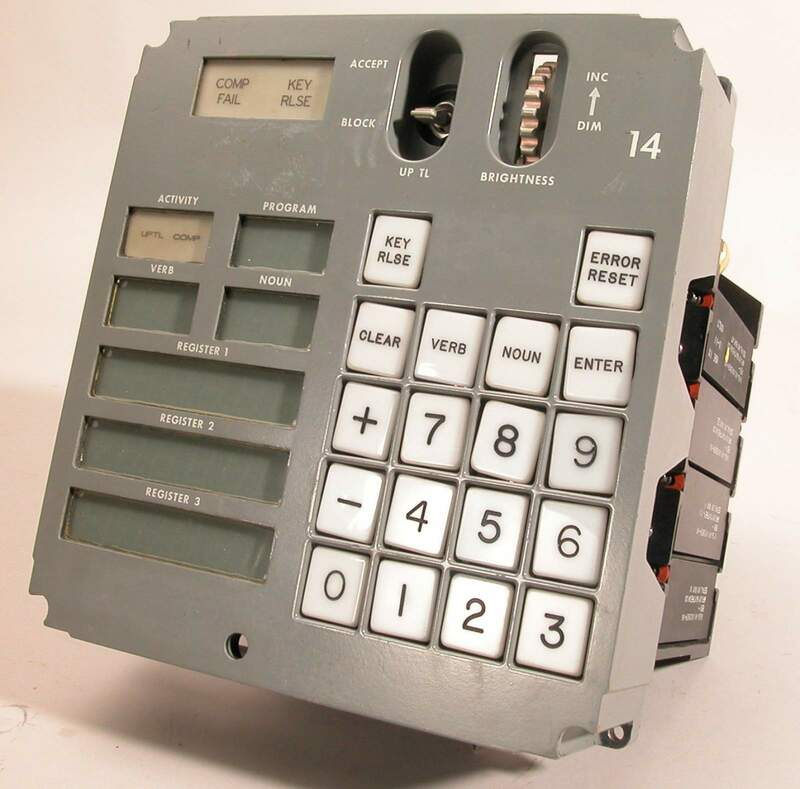 This is an interesting version of the AGC, in that the logic circuitry was constructed in a very different fashion than later dash numbers of 2003100 (and the later versions 2003200 and 2003993) were. Those later versions used multi-layer printed circuit boards to hold the integrated circuits, whereas this version interconnected them via a nickel ribbon. The nickel-ribbon design turned out to have too much capacitance, resulting in excessive signal delay, and the design didn't function in practice. This is what resulted in the introduction of multi-layer printed circuit boards instead. That's not to say, of course, that there's anything wrong with the electrical schematics for this design, since the physical construction of the circuitry is basically outside the scope of the electrical schematics. I'm told that all existing functional 2003100 AGC units are of the multi-layer printed-circuit variety. In addition to the nickel-ribbon interconnect, the circuitry for the various modules was actually divided into four separate "quadrants" of circuitry, which were mostly rather independent but did have some interaction with each other. Later designs removed the concept of quadrants altogether. Besides the reference sources mentioned earlier, AC Electronics document ND-1021043 of March 10, 1966, supposedly relates to AGC p/n 2003100-021 (according to its Tables 3-I and 7-I), and its Table 8-II lists all of the associated module drawings. But I don't believe there are any differences between the circuitry it presents and that presented by ND-1021042. Finally, there's the question of "signal wiring diagrams". These are related to the nickel-ribbon interconnect described above. To understand what that is and how to read one, consult the Appendix. It should be noted that because of the later reworking of the design to replace the nickel-ribbon interconnect with a multi-layer printed circuit board, the reference designators and pin numbering from later versions is not closely related to numbering of this version of the design. The way different part numbers of AGCs (or DSKYs) are related to one another is that you start with a given assembly with a certain part number (such as Block II AGC with p/n 2003100-011), then you apply an Engineering Change Proposal, or ECP for short, such as ECP 322 (described as "computer wiring changes"), with the result that you now have a different assembly p/n 2003100-021. The list below shows how all known Block II AGC part numbers are interrelated according to the principle just mentioned. Many of these changes clearly are not electrical in nature, or else refer to intermediate or test versions of the AGC. Sometimes there are multiple paths to get to the same part number, if the ECPs are applied in different orders. For example, p/n 2003993-061 + ECP 815 = p/n 2003993-071 + ECP 719 = p/n 2003993-111. I've only bothered to show one such path below in the few cases where that happens. Note that there is also an ECP 483 for p/n 203993 listed in Table 8-II of document ND-1021042 (from which the information above came), but I haven't been able so far to find out what it is, nor at what dash number of 2003993 it became effective. We don't have an official document, in so far as I am aware, giving the Instrumentation Lab's part numbers for electronics components like resistors, capacitors, transistors, and so on. Many of them are deducible from other documents, like the AGC Handbook drawings. For example, from drawing 2005952-, we can find out that part number 1006750-32 is a 1/4W 1K resistor with a 2% tolerance, while part number 1010406-7 is an 8.2 μH 10% tolerance R.F. coil. Mike Stewart (thanks, Mike!) has done a lot of that for us, but the task is still incomplete. The list above may not be fully up-to-date with respect to the master list, which is actually in our GitHub repository. If you have corrections or additions to this table, I believe you can edit the table directly in GitHub, though your changes won't go live unless we approve them. In addition to the raw list of part numbers above, we have the Specification Control Drawings (SCDs) for most of them. In modern terms you can think of the SCD as being like the data sheets for the components, except that instead of being written by the manufacturers, they are Instrumentation Lab drawings, and serve roughly the same purpose. We have most of the SCDs in multiple revisions, so if you're interested in that kind of thing, you can see how the specifications evolved over time. If you want to see them, look on our AGC engineering-drawing index page. First, an elementary introductory digression, for anyone who isn't an electronics expert but has persevered in reading to this point. When designing electronic circuitry, it is customary to assign each electrical component in the circuit a unique "reference designator" (or "refd", pronounced REF-DEE, for short), and to refer to the components by those refd's. The refd's can be anything, but customarily they consist of a letter to indicate the general type of component — R for resistors, C for capacitors, D (or perhaps CR) for diodes, and so on — followed by a number to indicate which specific component it is within the circuit. For example, in the typical kind of circuit diagram shown to the right, you see resistors R1 through R7, capacitor C3, transistors Q1 through Q3, and so on. Integrated circuits (IC's) typically have U as the alphabetical prefix, thus you might have integrated circuits U1, U2, U3, etc. One thing that happens sometimes is that a given component might actually be a conveniently packaged-together collection of several essentially interchangeable simpler parts. For example, a "dual NOR gate" integrated circuit would be a device that provides two separate NOR gates, which are independent of each other but are packaged together to save space or cost or for some other reason of convenience. When that happens, the overall integrated circuit still has a U-based refd, perhaps U3, but the two NOR-gates comprising it each have refd's of their own, which would normally be U3A and U3B. The example of a NOR-gate wasn't chosen arbitrarily. In fact, since integrated circuits were a pretty new development during the early Apollo Program, and were still suspiciously unreliable and quite expensive, the AGC circuitry originally didn't use any of them. Eventually, though, the relentless pressure to miniaturize forced integrated circuits into the design. As it happens, the AGC ended up using a single type of integrated circuit (the DSKY used none at all), though it used lots of them. 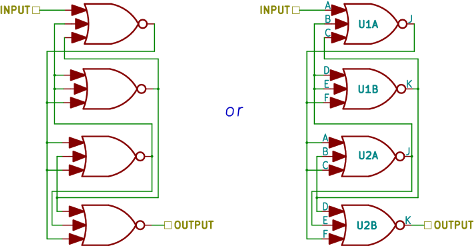 As you've probably guessed, that one type of IC was in fact a dual triple-input NOR gate. Do not list any pin numbers for the NOR-gate inputs, so we have know way of knowing which of the interchangeable inputs any given input signal is hooked up to. To get a sense of this, to the right there are two versions of a sample (nonsense) circuit consisting of NOR gates, one with refd's and pin numbers, and one without. In the right-hand version, we know, for example, that pin U1A-J is connected to pins U1B-F, U2A-F, and U2B-F. In the left-hand version we know that the output from one NOR gate is connected to some input or other on each of the other NOR gates. Imagine trying to repair or discuss the left-hand version! As far as the operation of the circuit is concerned, of course, it makes no difference at all whether or not those refd's or pin numbers are there, because all of the NOR gates are interchangeable and all of the inputs to them are interchangeable, so the OUTPUT we get from any given INPUT is still exactly the same. In the same way, you personally may not care one way or the other which specific NOR gate is used for any given purpose in the AGC circuitry, nor may you care which input pin is which on those NOR gates. If that's so, you don't need to read any further ... just go back to looking at the schematics presented above on this page and enjoy! You may be forgiven for thinking that this makes the situation even more confusing to deal with, particularly since you are quite correct about it, but it helps if you know how to read it! When you know how to read it, it tells you which NOR-gates are paired into which in the dual NOR-gate IC's, which of the pair is the "A" member of the duet and which is the "B" member, and which pin numbers the signals are hooked up to. It doesn't tell you exactly how to specify the refd's of the dual-NOR IC's, but we know from other versions of the AGC roughly how they did that, so we'll talk about that later. The first thing to notice is that one side of the diagram is marked as LEFT and the other as RIGHT. In this drawing, LEFT is at the bottom and RIGHT is at the top, but in other drawings that's reversed, so try to think only of LEFT and RIGHT instead of bottom and top. Next, notice the little numbers written along the LEFT or bottom edge (39155, 39145, 39149, ...) and RIGHT or top edge (39156, 19151, 39152, ...). Those numbers are actually written on the NOR gates in the schematics, in lieu of refd's, and each individual NOR gate is identified uniquely by these numbers. These are called "gate numbers". So, a pair of such gate numbers could uniquely specify a dual-NOR gate. The RIGHT numbers are the "A" NOR gates, and the numbers opposite them on the LEFT are the associated "B" NOR gates within the same dual NOR IC. Ignore the fact that the NOR gates now look like little rocket ships; that may or may not be significant. 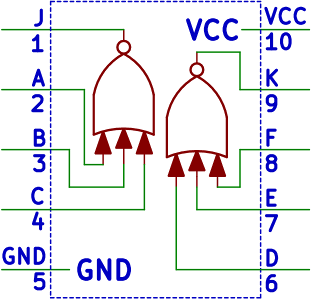 Rather, the important things to note are that there are VCC and GND inputs to power the device, that the "A" gate has pins 1-4 (or J, A, B, C), and that the "B" gate has pins 6-9 (or D, E, F, K). 2 other things not related to the NOR. An oval with a very smudgy 111 written in it. Maybe. Now, if you know anything about electronics, you may be worried that the outputs of two different NOR gates are tied together. Don't worry, though, these NOR-gates have open-collector outputs (or more precisely, open-collector with a pullup resistor to VCC), and so they can be tied together to increase their drive capacity (or to effectively increase the number of NOR inputs for a single output) without any problem. A numbered oval is a pin on the connector from the circuit to the AGC's backplane. In other words, a signal leaving or entering the circuit. A pointed box like <VCC> or <0V> is a power-supply or ground connection. A rectangular box with an alphanumeric label inside of it is an "inter-quadrant" connection, and we'll get to that in a moment. At any rate, the point is that this red wire represents two NOR-gates tied together to drive connector pin 111. Now, I didn't mention it before, but this signal wiring diagram happens to be from sheet 1 of drawing 2005061D, and if we look at that drawing, we will indeed find that connector pin 111 is being driven by NOR gates 39107 and 39155. What is this "inter-quadrant" thing of which I spoke, and for that matter, what is a "quadrant" anyway? 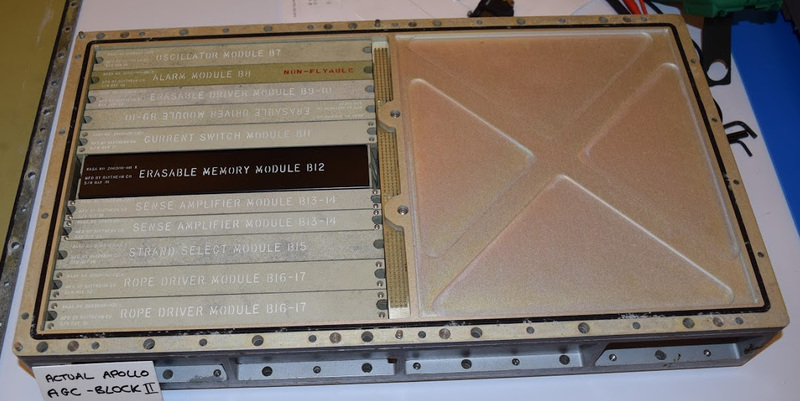 For these AGC modules, the connector from the module to the AGC backplane has 4 rows of 69 pins each (numbered 1 to 71, but with 21 and 51 missing). Each one of those rows of pins essentially has its own circuit associated with it, and these separate circuits are called "quadrants". The concept of the "quadrant" was used only for early dash numbers of the 2003100 AGC (such as the one we have schematics for! ), and disappeared for later 2003100 versions, and for the 2003200 and 2003993 AGC's, though much of the numbering of components on the schematics remains tied to the quadrant concept even if the quadrants themselves disappeared. By "separate circuits", I mean logically separate rather than physically separated onto different circuit boards, though apparently that was originally what was tried. And usually, the circuitry on the quadrants isn't entirely logically independent of the circuitry on the other quadrants, and in that case there have to be one or more electrical connections between the quadrants of the module ... i.e., inter-quadrant connections. In fact, the signal wiring diagram I've been showing you isn't the complete diagram for drawing 2005061D, but simply the signal wiring diagram for quadrant 1 of 2005061D. There are three other quadrants, and therefore 3 other signal wiring diagrams for this module as well. Most modules have a complete complement of 4 quadrants, and thus have 4 signal wiring diagrams associated with them. But some modules have less quadrants and therefore less signal wiring diagrams. So now all of the questions are answered except for refd's. For that, I want to direct your attention just above the row of gate numbers at the bottom edge of the signal wiring diagram shown above, or just below the row of gate numbers along the top edge. You'll see a row of tiny, tiny numbers going from 1 (at the left) to 180 (at the right) there. Or more accurately, you'll see rows of tiny smudges that may or may not be numbers, but you can still see that there are 180 of them. Let's call these things "smudge numbers", for lack of a better term. The IC's are numbered sequentially, starting at the end with the larger smudge numbers, where we find U01, and moving toward the end with the smaller smudge numbers, where we find U30. Actually, there's some subtlety involve here. For example, what happens if there's an open space, as there is in our pictured signal wiring diagram at U23? Should we just skip U23 in our numbering altogether, or should the next position become U23 rather than U24? You could argue it either way, but I'd vote for skipping U23 altogether, because it helps preserve IC numbering across different hardware versions. In other words, if a dual-NOR is removed or added, it won't necessarily cause all of the refd's for the other dual-NORs to change. But truthfully, we don't actually know what the original designers did in this regard. Another subtlety in the IC numbering is the quadrants: The entire circuit module consists of 4 quadrants, and if we followed the scheme just described, there would be 4 IC's labeled U01, 4 labeled U02, and so on. Not good! So in our CAD work we actually prefix the quadrant numbers to the IC numbering. In other words, in quadrant 1, the IC's run from U101 up to U130; in quadrant 2, the IC's run from U201 up to U230; etc. Thus every IC ends up with a unique number within the module, and we can still use that number to precisely identify where it is located physically. And finally, one last subtlety: Some of the quadrants have signal wiring diagrams as shown, with LEFT on the bottom, RIGHT on the top, and smudge numbers increasing from left to right. Other quadrants are reversed, with RIGHT on the bottom, LEFT on the top, and smudge numbers increasing from right to left. My descriptions above are all still correct, as long as you keep thinking of LEFT and RIGHT and ordering of smudge numbers as I've urged, rather than thinking of the top, bottom, right, and left edges of the signal wiring diagram as you might otherwise be inclined to do. The reason for this reversal seems to have to do with some of the quadrants being on the front side, and some being on the back side, with the numbering consequently mirror imaged. For the Block I AGC, problems similar to those described in the preceding section exist, though the problems and solutions are different in detail. In fact, read the preceding section before reading this one so that you can have some background for the discussion in this section! One problem that can thankfully be ignored in the Block I AGC is that the NOR-gate integrated circuit contains a single triple-input NOR gate, packaged in a TO-47 can, rather than two independent NOR gates packaged together in a flatpack, as in the Block II AGC. That simplifies a lot. You can see both a photo of such a gate (to the left) and a diagram elucidating its pinout and internal circuit (to the right). A problem the Block I "logic flow diagrams" (schematics containing NOR gates) have that the Block II doesn't have, is that there were apparently multiple hardware generations of the Block I AGC that were mechanically quite different. In particular, both the backplane-connector pin numbers and the means for identifying the NOR-gate components differed from one hardware generation to the next. 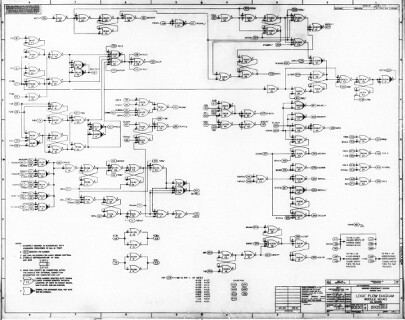 The schematic diagrams, meanwhile, showed the connector pin numbers and gate identification for multiple hardware generations, thus making them a tad more confusing than they might have been otherwise. 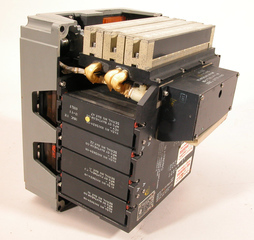 The "AGC 4" generation: Might have been a rack-mount computer. I.e., not of a similar size or shape to flight models. The "AGC 4B" generation: Might have been the first with integrated circuits, as opposed to NOR gates constructed from discrete transistors and resistors as in the diagram to the right (which represents the internal structure of the NOR integrated circuit). Using integrated circuits would have miniaturized the circuit. The substitution doesn't affect functionality, so we'd expect software written for the one generation to execute properly on the other generation. The "AGC 5" generation: Might have been constructed more-or-less the same was as the flight computers were. I.e., in a similar form factor. For example, in the tiny excerpt from one of the Block I electrical schematics to the left, consider the NOR gate with the markings "2G5" and "65129". "2G5" was how the gate was identified in generation "AGC 4", while "65129" was how it was identified in generation "AGC 5", according to the notes (not shown) written in the schematic itself. Similarly, consider the connector pin for the backplane signal "MPO". It is marked both as pin #94 and as pin #104. The former is for AGC 4, while the latter is for AGC 5. However, the Block I AGC schematics have the same characteristics as the early Block II schematics, in the sense that they do not display pin numbers for the (interchangeable) inputs of the NOR gates, nor do they indicate what we would think of as reference designators for the NOR gates. 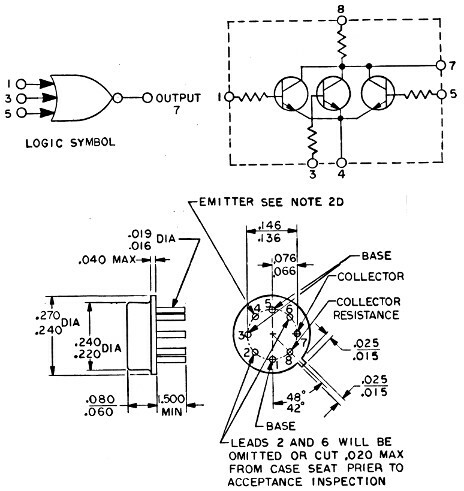 Of course, since there's was a single NOR gate per integrated circuit, the gate-number markings (like "2G5" or "65129) could basically serve double-duty as reference designators, and having a separate reference designator doesn't really serve much purpose, so perhaps there weren't any at all. Plus, each of the NOR gates in the example to the left has a single input ... but from the figure above, we know that pins 1, 3, and 5 of the NOR gate were all interchangeable, so which input is the one being used? They probably are not all the "middle" pin, pin #3, since that wouldn't always have been the pin it was most convenient to physically route a wire to. 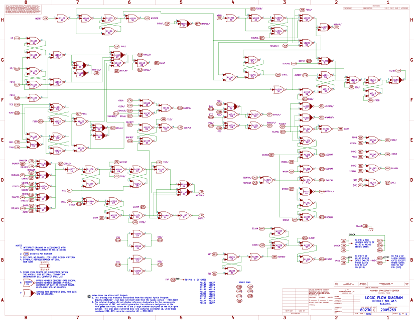 At any rate, since the schematic doesn't have this kind of info in it, the information has to come from somewhere else. It must instead be deduced instead from the so-called "wiring diagrams". These Block I wiring diagrams, however, though quite similar in concept were quite different in detail from the Block II signal wiring diagrams described in the preceding section. The image below is a wiring diagram for the Block I "scaler" module, otherwise known as AGC modules A33 and A34. (Identical modules were plugged into slots A33 and A34.) The wiring diagram itself is drawing 1006127A, while the corresponding electrical schematic drawing is 1006547G. The original drawing was in black&white (at least, by the time we got it), but I've added various color notations to it for the purpose of this discussion. Of those, 2 and 3 are intended to represent the front sides of the circuits, while 4, 6, 5, and 7 (being mirror imaged) represent the back side of the circuits. Of course, a mirror image of this arrangement, or indeed any other permutation of pins 1, 2, and 3 would logically be equally possible. Note too that some or all of the NOR-gate pins have solid black lines going to them, and of course these represent the wires. All of the fat, solid, black lines in the wiring diagram are wires. The final factoid needed to interpret the diagram is to note that each of the circuit halves seems to have wires that exit to the left or to the right, and then just stop in mid-air, so to speak, without actually connecting to anything. Notice, however, that the wires exiting to the left and the right are exactly paired with each other: for each wire exiting to the left, there's one at the exact same position vertically exiting to the right. This is intended to mean that those two dangling wires are connected together as the same signal. I've added a couple of blue lines to the diagram to make this point graphically. Actually, to avoid being misleading, I should admit that it's a little trickier than this sometimes. The true is that there's not necessarily a unique match between the dangling wires exiting to the left and those to the right, so sometimes you have to work it out using the schematic as a reference. The figure below is an excerpt from a different signal-wiring diagram that shows this ambiguity. 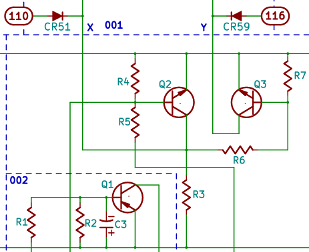 I can't really give you any advice on resolving such ambiguities, other than to say that if you trace through the wires, you'll (hopefully always) find that one of the possible connections makes no sense with respect to the associated schematic, and that the other one does. The output of --039, pin 7, exits to the left, where it wraps around and connects to a corresponding wire dangling at the right, and eventually ends up at connector pin 02. Output pin 7 of NOR gate --035. Input pin 1 of NOR gate --037. But finally, a word of caution: The match between electrical schematics and their associated signal wiring diagrams is not always as perfect as the explanation above implies. 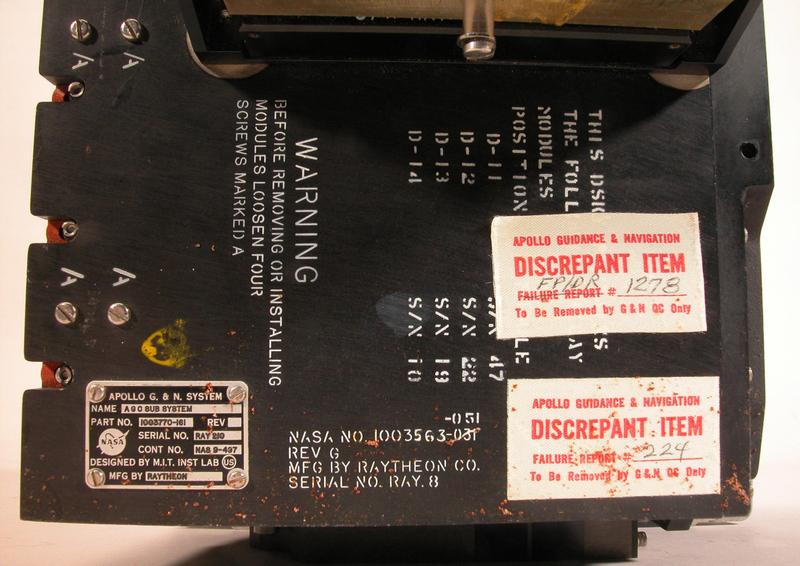 Of course, the Apollo Program preceded the availability of computerized CAD systems which could have automatically generated error-free signal wiring diagrams (if they were even needed at all!) directly from the schematics. In other words, both the schematics and the wiring diagrams had to be separately, manually drawn ... naturally, we'd expect occasional errors just on that account. But it's somewhat worse than that. Consider the example we've been using, namely schematic 1006547 and associated wiring diagram 1006127. This block of circuitry has NOR-gates labeled "--000" through "--079", plus additional NOR gates in the range "--301" and above. The schematic and wiring diagram match perfectly for the range 000-079, but completely differ for the range 301+, as if completely different circuits were being described by the schematic and the wiring diagram. And that may indeed be what happened, since the wiring diagram was drawn in February 1963, some three months prior to the schematic in May 1963. Possibly there had been second thoughts about the partitioning of the circuitry into modules in the interim. Thus where the schematics and wiring diagrams match, we should feel confident in using the information we find in the wiring diagrams to supplement what we find in the schematics, but we need to be aware that they may not match, and that we must be prepared to work from whichever one of those two is "correct". The schematic was drawn 3 months later than the wiring diagram, and is therefore more current. We have 2 revisions of the wiring diagram vs 8 of the schematic, so gross errors seem less likely to have survived in the schematic than in the wiring diagram. The documentation in AC Electronics ND-1021041 matches the schematic rather than the wiring diagram. Last modified by Ronald Burkey on 2019-04-19.